Erkunden Sie zwei der beliebtesten Wahrzeichen des Heiligen Tals, Moray und Maras, bei einer halbtägigen Führung. Besuchen Sie die landwirtschaftlichen Terrassen von Moray, von denen man glaubt, dass sie ein "Laboratorium" sind, um Pflanzen und Ökosysteme kennenzulernen. 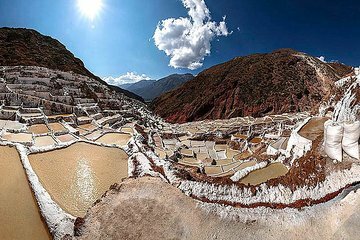 Dann begeben Sie sich zu den seit Inka-Zeiten genutzten Salzverdampfungsteichen von Maras und beenden die Tour mit einem Spaziergang durch das kleine Dorf Urubamba. I would recommend this tour based on the sights you will see alone. I agree with the other reviewer in that although about a third of the people on the bus were English speaking, the tour and some of the announcements like why we were stopping, etc. were mostly in Spanish. Its almost like the guide forgot. That said, he was nice and you just had to remind him occasionally. If you could get around this, the sights are fantastic and the price and length of the tour half day were just right. Some might feel its a bit short and might like more time to wander around- In that case you might want a private tour. Again, if you can deal with these things or adjust your expectations a bit, the sights will amaze you. I wish I could give this 3.5 stars, but Im feeling generous so 4-stars. This tour was okay. We were the only English speaking people on our tour and I speak enough Spanish to know that the version of the tour that we received vs the Spanish version was very limited. The tour makes a couple of stops at little shops where you are given the option to buy tourist-trap sorts of things. We visited Moray but didn't have much time to explore and, as I mentioned, our tour left a lot to be desired. Similarly, at Maras we were rushed and hurried along. We didn't visit Urubamba other than to stop at a little shop. I qualify this as okay because it took us to the places we wanted to see. However, if I was booking again I'd investigate the option of just getting a private driver/guide OR finding a tour that I believed would give me information and time to explore.